Darren Wilson is a Graphic Designer for Disney Design Group and his talents can be seen not only in his fine artwork but also in popular Disney Theme Park Authentic items such as Disney's co-branded Dooney and Bourke collections and on the high seas with Disney Cruise Line. Darren, your work continues to provide a sense of enchantment to our Guests. Your ability to capture some of our most notable Disney characters in many scenes and scenarios is just part of the charm and magic that makes them so special. What led you to want to depict the characters in such a unique style? Disney has such a rich history and tradition with its characters that I really try to capture the timeless quality of them. Over the years, I have developed my own vision of how I’ve perceived the characters to be and have created a unique art style that has become well known to Disney fans and collectors. I am inspired by the characters’ essences and nuances by bringing them to life through movement, composition, tone and attention to detail in a vintage classical way. Your upcoming pieces will surely capture the imagination of Disney enthusiasts and collectors everywhere. Can you give us some highlights and insights on the pieces you’ve created for your upcoming artist showcase and why you chose these subjects? 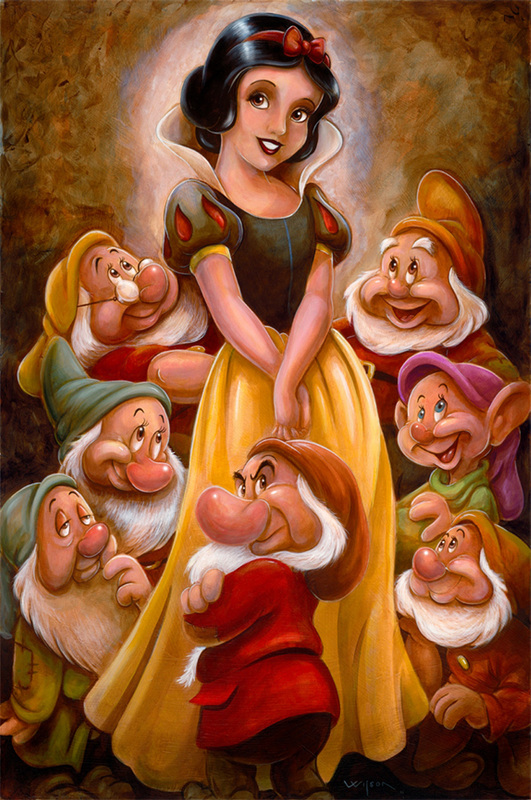 The first painting depicts a scene from one of my favorite movies, “Snow White and the Seven Dwarfs.” I wanted to put all the characters in a tight compact space all around Snow White and get them large enough to highlight all their expressions and individuality. In the second painting, Chip and Dale, I wanted to play up the humorous and mischievous look about them. I chose to keep the palate more tonal with hints of color. 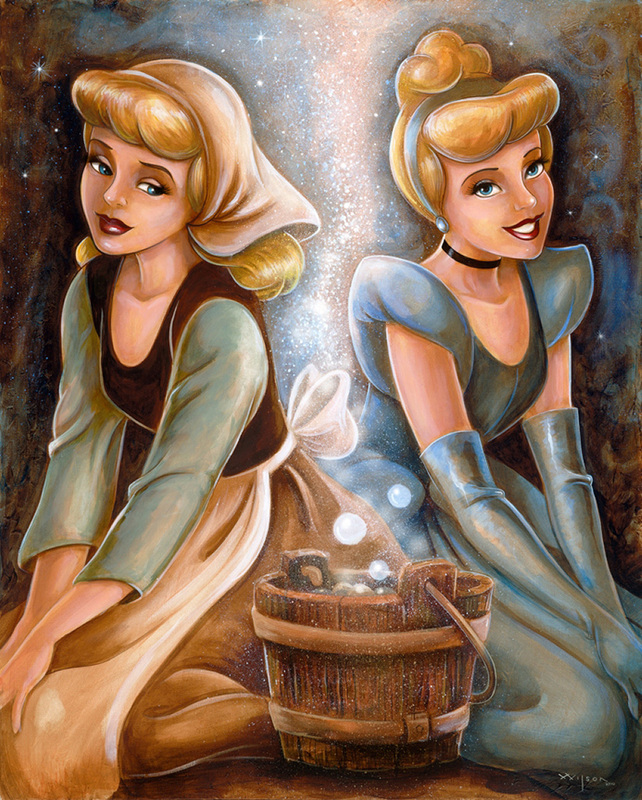 Lastly, I painted Cinderella from rags to riches transformation. This painting reminds me of a moment that we all can relate, where we have come from in life’s journey to where we are now. When you’re not creating your one-of-a-kind masterpieces, what additional items are you dreaming up for Disney Theme Park Merchandise? Have there been any projects from your past that stand out as favorites? I am currently working for the softlines division here in Attractions Merchandise. I am really excited about the work I have done with the cobranded business with Dooney & Bourke. I have created the character sketch print, along with fellow designer Donna Kozatek, which has been a huge hit with our guests! We also just released a Princess line of bags that I am excited about that depicts the princesses in cameo poses and is very colorful. I worked on Mickey, Minnie and Tinker Bell tattoo inspired art as well as some Pirates of the Caribbean apparel. But when it comes to the gallery work, I am really excited about the series of Disney Cruise Line paintings I have done for the Disney Dream. One of my favorite questions to ask is ‘How did you get your start with Disney?’ Everyone that comes to work at the most magical place on earth has a unique story to tell. Can you share your story with us? For my 8th birthday, I got a Walt Disney light-up drawing desk from my parents. The little plastic drawing desk was really cool with Disney characters that I could trace. That little desk inspired me and turned me into a drawing machine! It took several hundred ugly drawings; but before long, I became really good at sketching the characters. I have always been creative, winning art contests through my early years of education. I attended college on an art scholarship, and then graduated with a degree in design from Auburn University in 1993. I began my career in Nashville, Tennessee, where I worked as a designer for a public relations firm with clients such as Saturn and Bridgestone/Firestone. I also spent some time designing for a small studio in the heart of Music Row. I arrived in Orlando in 1996 and worked as a designer for Universal Studios. Soon after, I received the call I had been waiting for, and since that happy day in 1997, I have worked as a graphic designer for Walt Disney World. I have had the opportunity to create designs for the Magic Kingdom Park, Epcot, Disney’s Animal Kingdom, Disney Cruise Line, Disneys California Adventure, Disneyland and Disney’s Hollywood Studios. I have been happily creating original paintings for the Art of Disney galleries for the past 11 years.